Like many people, the “Creating a weblog in 15 minutes” screencast by DHH is what convinced me to try Rails. Since I have never found a version of this tutorial that works for Rails 2, I decided to roll my own; here’s my take on it. It will probably take a bit longer than 15 minutes, but I will try to include some useful advice that makes it worth the extra time. This tutorial will not use any scaffolding and I will try to explain all of the code where necessary. Also, note that I use Windows; the output might look different on your end (but not a lot). This tutorial assumes a very basic knowledge of the Model View Controller pattern and Object Orientation. Right, let’s get to it then! I’ll assume you have Rails 2.0.2 installed, with the proper gems (sqlite3-ruby for me, use another DB adapter at your peril; you can always change this later). What this last step will do is unpack (“freeze”) the Rails gems into your vendor/ directory. I like to do this to make sure Rails doesn’t accidentally change while working on a project, and vendoring everything is in my opinion generally just a good idea, to make sure everybody on your project team works with the same packages. That’s all there is to setting up the project. On to the next step, posts! Look at all the files that created. We get a model and controller for our Post resource, a unit test stub and a migration. New is the route that was created at the bottom. Let’s look at config/routes.rb a bit. All that has been added by this generator script is the map.resources :posts call near the top. This little command generates a whole bunch of convention-magic for us: default routes for posts. More on that later. By just adding these two simple lines, we'll make sure that for every Post we save, checks will be made to ensure it has a title and body and that the title is unique. Time to put this to use in our blog! 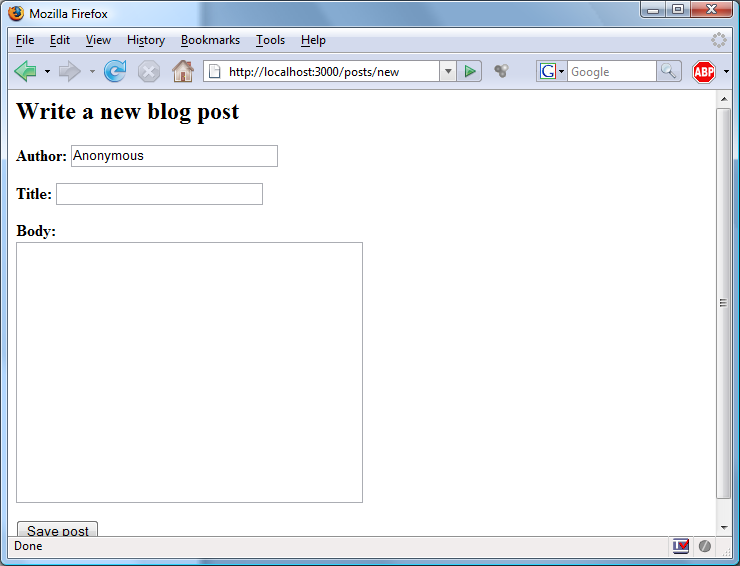 We'll need a way to write posts in our blog. For this we need two actions in our Post controller, by REST convention named new (for the form) and create (to actually create the Post). Let's start with the new action. In order to be able to take advantage of Rails' FormHelper, we'll need an empty Post object to work with. That's all this new method will be doing for now. 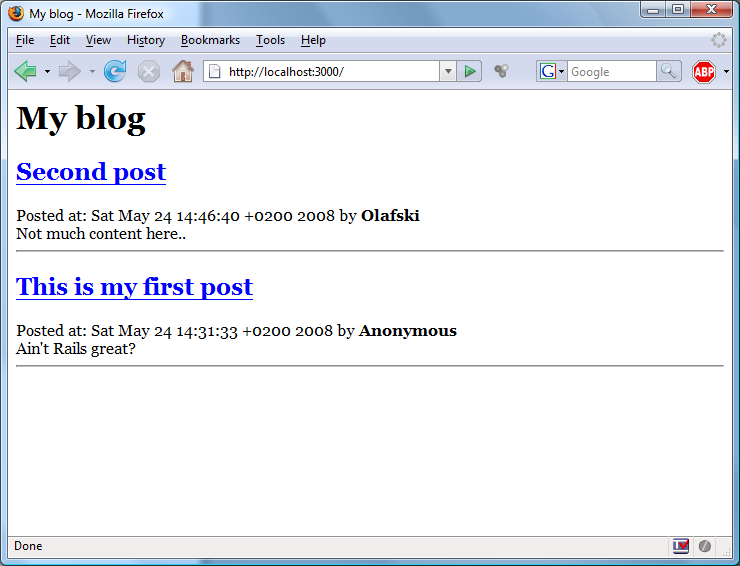 Now would probably be a good time to start our webserver so we can start looking at the produced work. I'm using WEBrick, but if you have Mongrel installed it will use that - don't worry, they will produce the same pages. 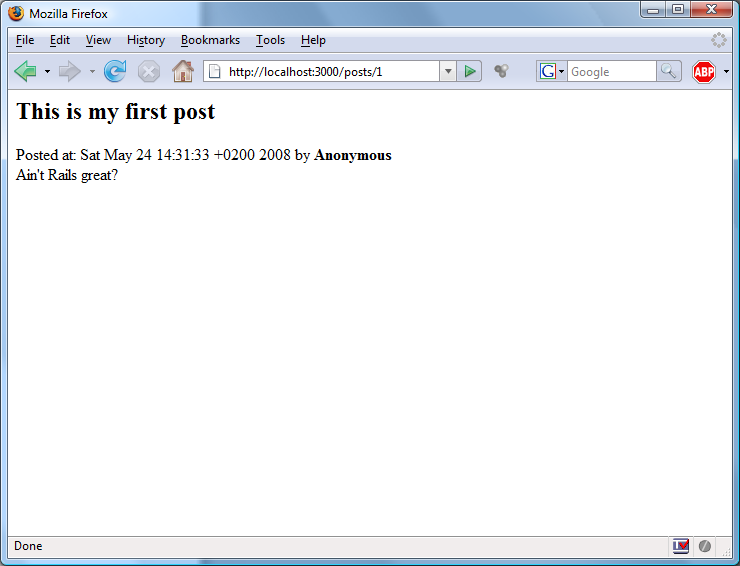 Now point your webbrowser to http://localhost:3000/posts/new. You'll be greeted by a friendly error message, telling you your view is missing. Let's fix that now, create a new file called new.html.erb in your app/views/posts directory. That's that. By using the form_for call, we'll have created a FormHelper object named post_form which we pass a block in which it exists. Doing this, we have access to convenient methods like post_form.text_field, which will automatically create a text field with correct settings for saving this Post later. It will also know the correct location to submit to because ActiveRecord tells the helper that @post is a new object. Submitting now won't do anything, so we'll need to implement that. By REST convention, saving new objects happens in the create action, so let's implement that in our controller now. Let's go through that step by step. 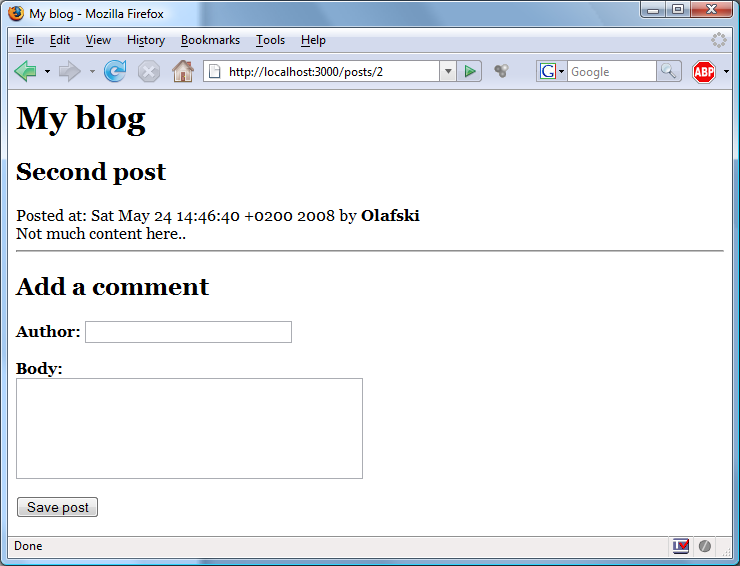 On line #4, we create a new Post object, instantiated by the parameters sent to us from the form. Because we used the FormHelper in the new action, this is all we need to do to create the Post. On line #6, we then attempt to save the Post. The save method returns true if saving succeeded (and the object was valid) or false if it did not. This way we can use it as a condition. On line #7, we set the flash message. This message will be saved in the session during the next request, after which it is discarded. We will display this later. On line #8, we redirect to @post. More about that in a second. If saving the post failed, we render the new action again. This last step will re-render the form. Because @post is now set to the Post submitted by the form, the previously entered values will still be available. 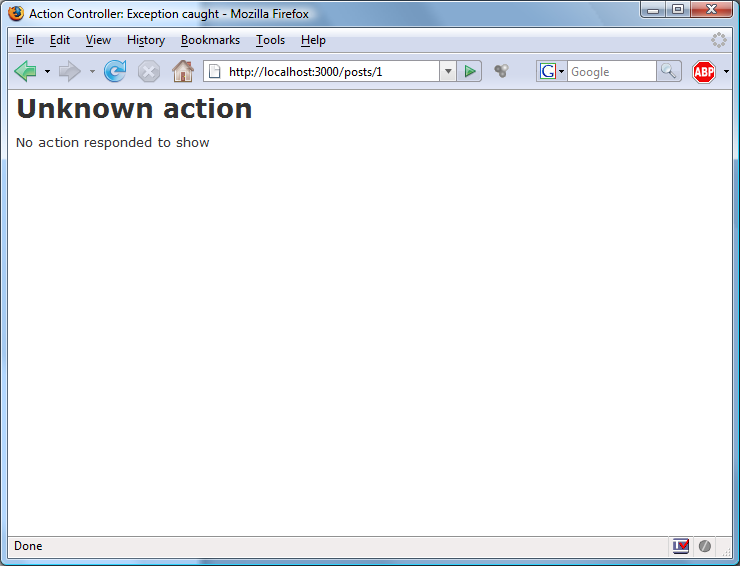 Also, any validation errors will be displayed at the top of the page by our call to error_messages_on. On line #8, we're redirecting to @post. How does Rails know where to redirect to? Now the map.resources call from config/routes.rb comes into play. Because we're sticking to the conventions, it will know that to display a Post, it will need to call the show action. Thus when saving the Post, you will be redirected to http://localhost/posts/1 (if you have any validation errors, you'll see something like this). Let's implement that action and its corresponding view now. 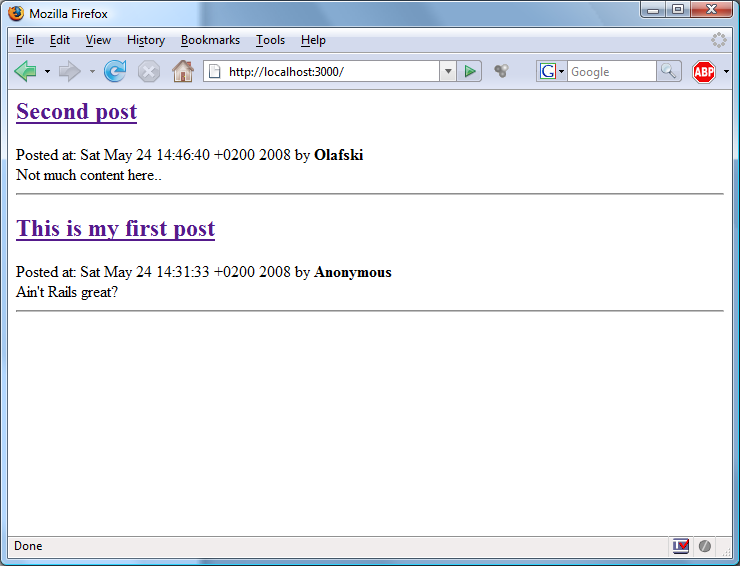 Refresh your browser and be greeted with your very first post. But isn't something missing? Don't posts need an author? I think they do. By REST convention, an overview of all instances of a class is shown in the index action. All we do in this action is fetch a list of all the posts in our blog. 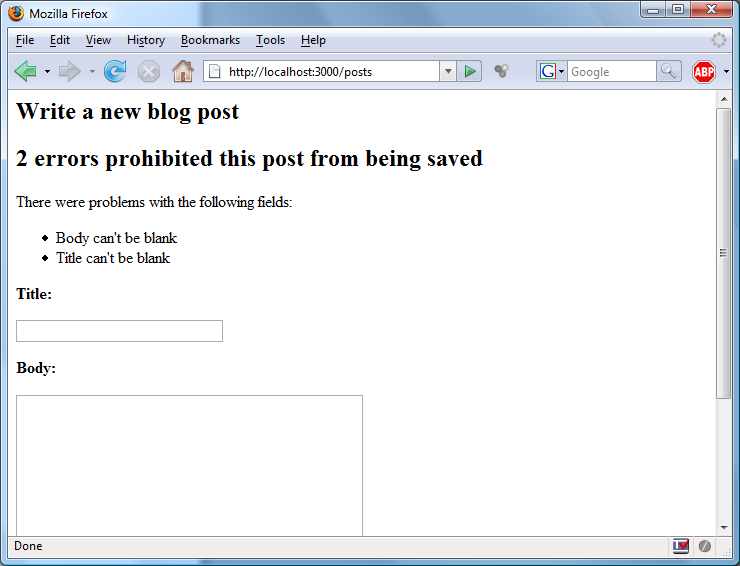 Note how we use the :condition parameter to find in order to reverse the posts. Next we'll need a view for this action. 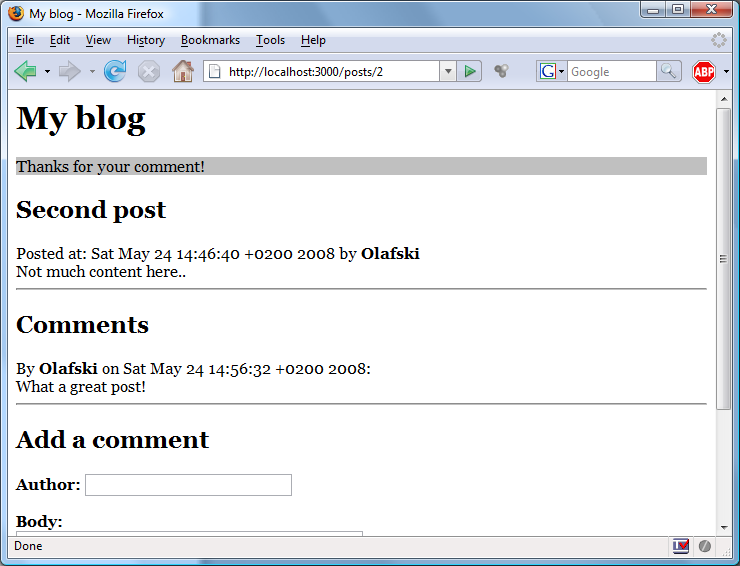 What this view will do is loop through the @posts variable and display each Post in turn. But wait, don't we already have the code in place to display a Post? We would be repeating ourselves if we wrote it again, and we don't want to do that. So how do we go about extracting the display code into a common file? Rails has a feature called partials for that. Partials are small templates which you can reuse in several views. We'll move some of the code from the show action into a partial called _post.html.erb. Partial names always start with an underscore. I have made three alterations. First I have added a horizontal line at the bottom so that the posts will be separated from each other on the index page and from their (soon to be implemented) comments on the show page. 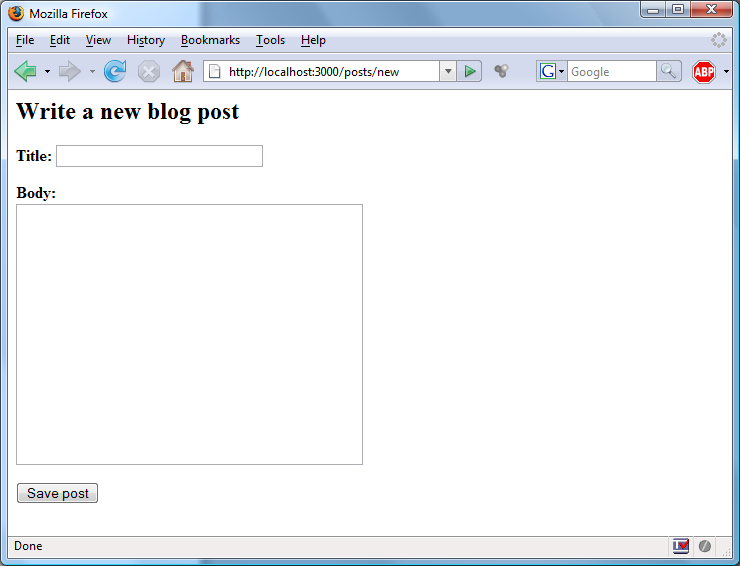 Second, I changed the normal display of the title to a conditional link. This way, the title will display as a link unless it's already on the page we're linking to; an easy shortcut to make sure clicking the title on the index page links you to the show page of the post. Note how we only use post as the target of the link. 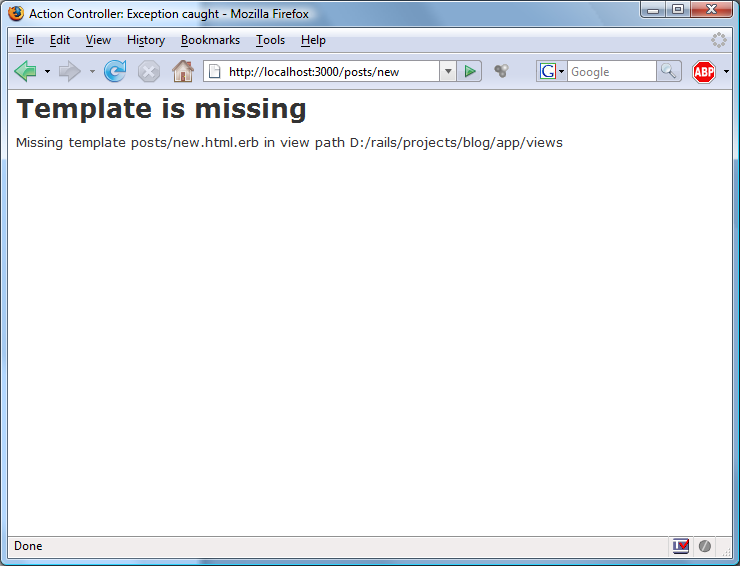 By yet another convention in REST, Rails will know what page to link to with just this. Excellent, now let's get writing the index view. We'll keep it simple, just a list of all the posts in reverse order. By providing a collection, this small bit of code will render the partial for each of the elements in the collection. 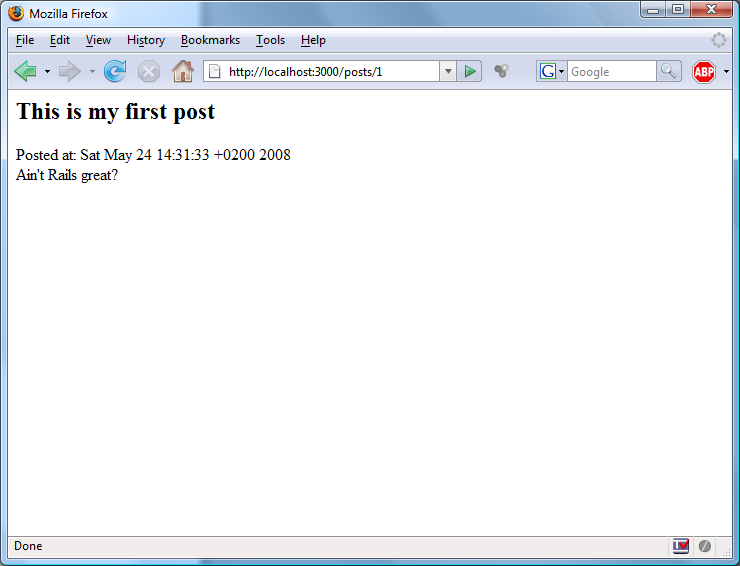 Point your browser to http://localhost:3000/ and view your beautiful weblog! Actually, it's not that beautiful is it? Perhaps we can add some basic layout to it. We'll add a layout that all pages share, so that we won't have to repeat it for every page. Layouts are placed in /app/views/layouts and have the same name as their controller (although you can of course override this). I'm more of a programmer than a graphics artist, so bear with me; we'll use a very simple layout that adds a page title and changes the fonts a bit. Most of this is basic HTML, but the important part is on lines #15 through #19 and #20. In lines #15 to #19, we check whether a special variable called flash[:notice] exists, as we talked about before. If it exists, we display it (try writing a new post now, you'll see the message). Next on line #20 we call yield, which will insert the original content of the view we're looking at. Try it; refresh the index view and you'll see a page with a title and some layout added. Other than that, the behavior is not changed. On lines #7 through #14, we display the current comments by looping through @post.comments. We get this collection "for free" by telling Rails that a Post has_many comments. Also note that if this collection is empty, we completely omit this part (including the heading). Also note the flash, right under the title. This status message will be shown only once, refresh and it's gone. Finally, you can download a zipped up version of this project if you don't feel like copy/pasting all the code. Thanks go out to mokogobo, celgin and mcarter from #rubyonrails on Freenode for proofreading this tutorial and helping me remove (hopefully all of) the errors. Fantastic! go ahead with such these tutorials. This was really helpful, especially considering that the video is so shamefully outdated by now. Thanks a lot!!! Many many thanks! I have struggled through some of the not-quite-2.0 tutorials, this one was No Sweat! I loved how you used the sqlite default, rather than include pages on how to change to MySql, pointless for a tutorial. Freezing rails was a little heavy for a tutorial, but you kept it short. You can skip the :collection in render :partial. Just pass the array and it does the right thing. VERY GOOD. Keep posting things like this! Excellent tutorial, thanks much. One question though: how did you get to list the comments from “last to first”. That is, listing the 2nd post first? In the original screencast DHH used a “@array.reverse” method but I’m not sure where this goes in this case? Thanks! Never mind! Got it. Thanks again. When I submit comments via this method, I get a flash[:notice] telling me that something didn’t go right, but I don’t get the validation error message/functionality as part of the response. What happened there? hi i am not able to save the post id in comments. it returns null, what shd i do? Nicholas, as far as I can remember you should not include an ID in your insert query, since that ID will be automatically generated. It has been a while since I used either Rails or SQLite so it could be that SQLite does not support auto-increment columns, but that query looks alright to me. I should also note that this tutorial was written for a rather old version of Rails by now, perhaps you should try to find one that is for a more recent version =) You could of course get the specific version of Rails I used in this tutorial but that might teach you some things that are considered bad practice by now.